"An impressive side dish that will be your new go-to sweet potato recipe." Scrub sweet potatoes and then oven roast, skin on for 40-45 minutes or until soft to the touch. Cool slightly. 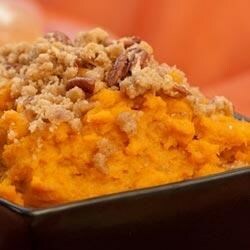 Gently cut the top third off the sweet potatoes and scoop filing into a bowl. Reserve skins if using. Mash potatoes with a fork. Add yogurt and spices and mix well. Spoon filling back into the skins or into 6 lightly buttered ramekins. Sprinkle each with 1 tsp. brown sugar. Set to bake for 15-18 minutes or until heated through.